Public Services Student Assistant Jessie Meiers explores the pioneering career of basketball coach and KU Alumnus, John B. McLendon. John B. McLendon, Jr. was born in Hiawatha, Kansas and graduated from KU in 1936 with a degree in Physical Education. While at KU, he studied basketball under its creator, Dr. James Naismith. Though not allowed to play on the varsity team at KU due to the university’s color line, he would go on to an impressive career as a basketball coach. He won eight CIAA (Central Intercollegiate Athletic Association) championships. He also invented several facets of the game, including the fast break, zone press, and four corners offense. McLendon became the first African American to win an integrated national championship, lead the National All-Star Team, coach at a predominately white college (Cleveland State), and coach a professional basketball team (the Cleveland Pipers in the American Basketball League). He was also the first coach to win three consecutive National Association of Intercollegiate Athletics (NAIA) championships (1957, 1958, and 1959). 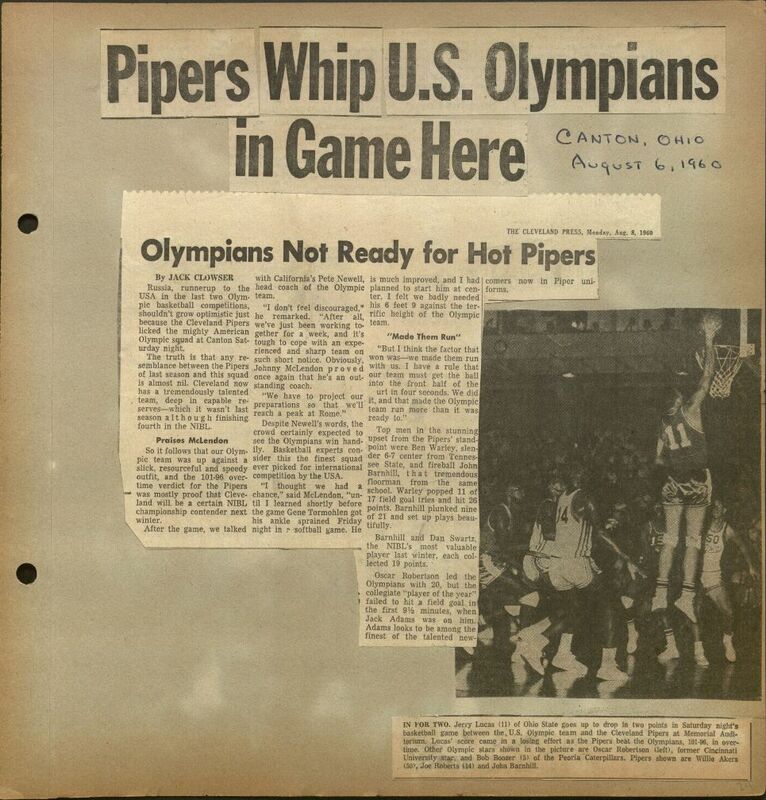 John B. McLendon’s scrapbooks documenting the win. Call Number: RH MS E198 vol. 11, page 24 (recto). Click images to enlarge. 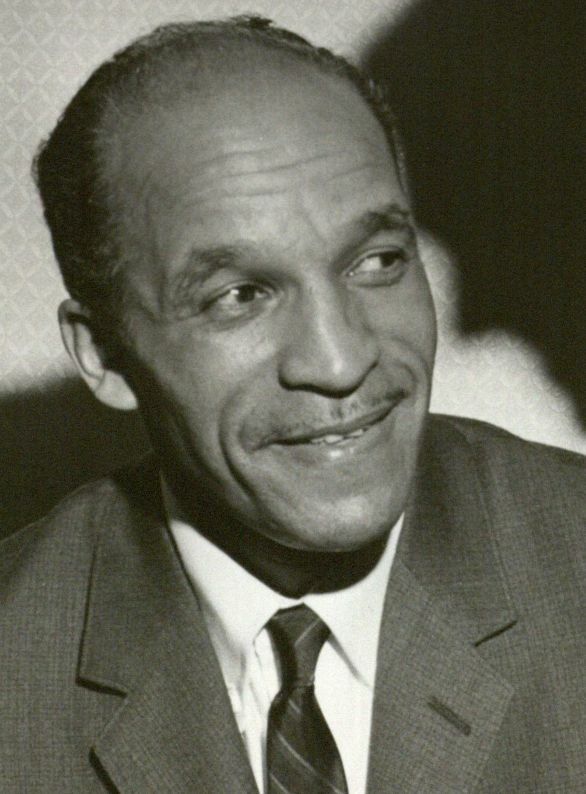 In 1964, McLendon became the first African American coach appointed to the U. S. Olympic Committee. McLendon would also act as a scout for the Olympic team, starting in 1966 and continuing until 1976. In 1968, he would join the coaching team of the USA’s gold-winning Olympic team in basketball and would return in 1972 to coach the team again. 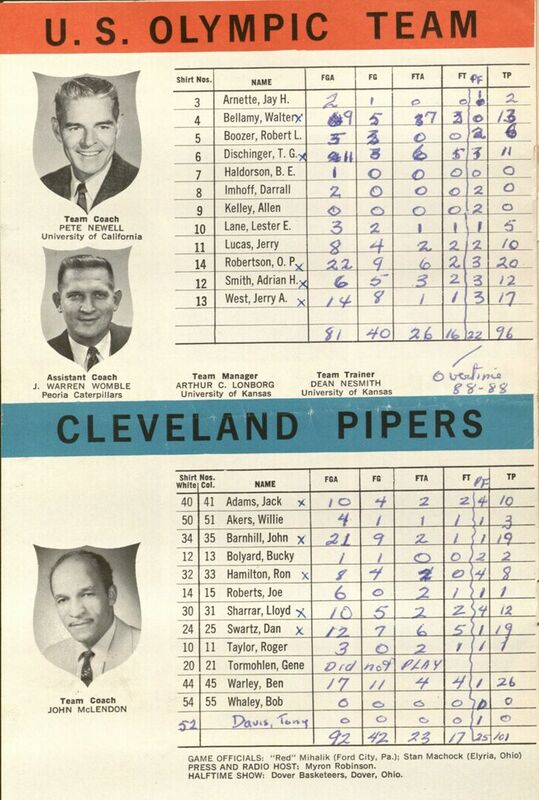 Scouting Scoring Book. Call Number: RH MS 586 Box 1, Folder 3. John McLendon donated a series of scrapbooks to the Spencer Research Library covering his career from 1954 to 1979 (RH MS E198). They feature newspaper clippings, pamphlets, and letters and cards from players, coaches, and major names in basketball congratulating him on his many honors. 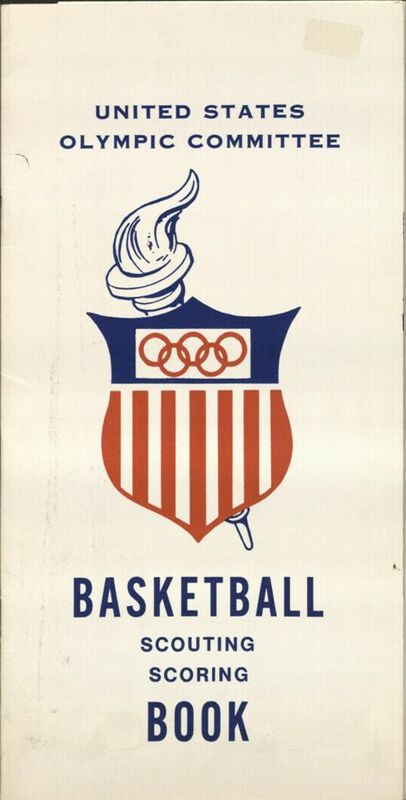 His personal papers include his “United States Olympic Committee Basketball Scouting Scoring Book” (RH MS 586 Box 1, item 3.8) and a typescript of “The Chronological History of Basketball in Black Colleges in the USA, Period IV 1950-1960” (RH MS 586, Box 2, item 12), which he wrote in 1980. This entry was posted on Friday, August 10th, 2012 at 5:04 pm and is filed under Kansas Collection. You can skip to the end and leave a response. Pinging is currently not allowed.